Today’s Daily Update, which follows up on yesterday’s Pro-Neutrality, Anti-Title II article on net neutrality regulation, is free for everyone. First off, I appreciate all of your continued support — especially those of you who strongly disagreed with yesterday’s article. Long-time readers know I have wrestled with this topic for years, intensely so over the past week, and I do think I can clearly articulate both sides of the issue. At a minimum I hope I helped those of you who do disagree at least sharpen your understanding of why exactly you do. Do note that I changed the title of the article from “Why Ajit Pai is Right” to “Pro-Neutrality, Anti-Title II”; I hadn’t thought too much about the title when I posted it, but in retrospect my choice made the topic even more controversial, at least on Twitter. In fact my opinion is a lot less radical than some seem to have taken it as (which the new title reflects): I absolutely support regulation of ISPs and the preservation of the neutrality (at least in terms of blocking content), I just think we should stick to ex-post instead of ex-ante until there is compelling evidence of systematic abuse. The equation is straightforward: there is wide consensus amongst economists of all political stripes that regulation imposes costs on both innovation and society through regulatory capture; I would prefer to avoid bearing that cost until we are certain it is necessary, particularly since the evidence to date suggests after-the-fact regulation is working. Millions of people first came online thanks to services like America Online — walled gardens that weren’t neutral by any means. Now to be clear, that’s not really relevant to this debate (you’ll find that a huge number of “neutrality” issues aren’t actually covered by these regulations, by the way), beyond the observation that foreclosure can deliver a superior customer experience such that a meaningful change occurs in the market. In this case, the millions of people who came online for AOL’s content were soon better served by the open web, giving rise to more neutral ISPs that worked over dial-up. Those ISPs were possible because of Title II which, as I noted yesterday, was created for the explicit purpose of governing AT&T. Telephone service was a “common carrier”, which meant the local phone company couldn’t restrict ISPs from using phone lines. The problem, of course, is that dial-up was dreadfully slow, occupied the phone line, etc. Beginning in the late 90s two new broadband technologies began to become available: cable modems and DSL over phone lines. DSL was a big improvement over dial-up, offering faster speeds, always-on connectivity, the ability to still use your phone line for voice calls, etc. And, keeping with the established regulatory regime for telephone lines, DSL services were also covered by Title II, which meant that multiple ISPs could use the telephone lines. Cable modems, though, were unregulated (and thus ISP service was held exclusively by cable companies). Three important regulatory changes then occurred between 2002 and 2005. First, in 2002, the FCC classified cable modem service as a Title I service; this wasn’t a change in practice, as it effectively codified the “light touch” approach that had characterized cable modem access from the beginning. In 2003 the FCC ended the requirement that phone companies share their lines with other ISPs for DSL service at mandated rates. In 2005 the FCC re-classified DSL service as a Title I service, bringing it to parity with cable. The evidence in U.S. broadband markets suggests that efficiency gains from deregulation. Cable modem services held nearly a two-to-one market share advantage when DSL carriers were most heavily obligated to provide “open access” to competing ISPs. 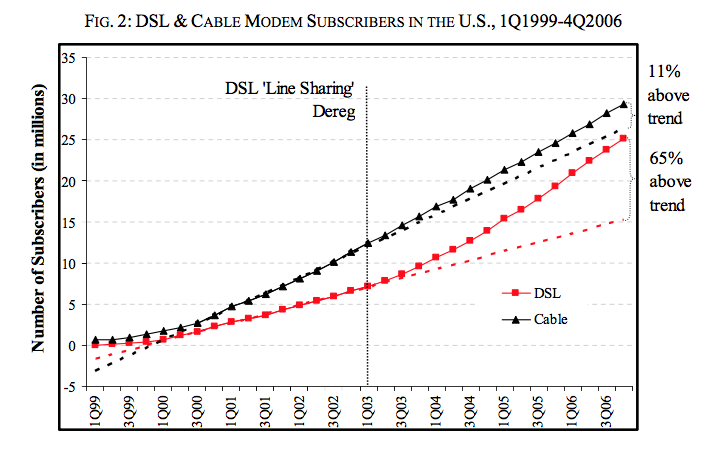 Once the FCC eliminated a key provision of that access regime, ending line sharing in a Feb. 2003 ruling, DSL subscribership increased dramatically. By year-end 2006, DSL subscribership was 65% higher – more than 9 million households – than it would have been under the linear trend established under “open access” regulation. DSL growth gains are in evidence even when contemporaneous trends in U.S. cable modem subscribers and Canadian broadband subscribers (both DSL and CM) are controlled for. Moreover, when further DSL deregulation was granted by the FCC as of August 2005, DSL growth did not decline. This robust deployment response is inconsistent with the view that broadband regulation promotes innovation that spurs infrastructure investment or deployment. Note the Canadian broadband control set: there was not a similar shift in DSL numbers in Canada, suggesting that it is unlikely a secular technology shift drove these numbers. To be clear, I am not posing this study as the end-all be-all in this debate; what it does suggest, though, is that if investment in broadband is a priority, then the regulatory approach taken to cable broadband all along — the so-called “light touch” — is preferable to that taken to DSL. Indeed, there is at least an argument to be made that one of the reasons cable companies are so dominant in fixed-line broadband is because of the big head-start they gained around the turn of the century — that is, it is at least possible that regulation put us in the situation we are today. The other reason I regret not diving deeper into this yesterday is that it gets at the core tradeoff that must be made in this debate. Many, many people argued that yesterday’s article was mistaken because it counted on there being a competitive market to police ISPs. In fact, I didn’t really press that point at all; I actually had an entire section at the end pointing out that fixed-line broadband competition is far too limited in many parts of the U.S. I agree that simply saying “the market will sort it out” isn’t a satisfactory response, because the market is in bad shape (it is, though, improving, not just in cities with competitive FiOS offerings, but also thanks to wireless; no, wireless isn’t fully competitive with fixed-line, particularly in terms of bandwidth volume, but speeds are getting close and permitted volumes continue to rise rapidly). The question that must be grappled with, though, is whether or not the Internet is “done.” By that I mean that today’s bandwidth is all we all never need, which means we can risk chilling investment through prophylactic regulation and the elimination of price signals that may spur infrastructure build-out (that being the elimination of paid prioritization). Remember, the United States is a country where one of the two major political parties routinely threatens to default on the nation’s debt to score political points. Infrastructure investment is embarrassingly low in things like roads and bridges, much less in environmentally sustainable power like nuclear. To put the future of broadband, something that requires continual investment, into the hands of such a dysfunctional government seems foolhardy at best. And yet, the fact that wired broadband in particular is a natural monopoly remains, raising the question of how you incentivize investment in ever faster broadband? I concluded by favoring usage-based pricing, but as I indicated yesterday, I’m increasingly amenable to the idea of paid prioritization. I at least think it is worth an experiment: shouldn’t we at least see if our worst fears are confirmed before we let them drive our decision-making? These tradeoffs are brutally difficult. It should be obvious to anyone who reads Stratechery regularly that I am extremely suspicious of monopolies specifically and centralized power generally: the idea of giving ISPs free reign makes my skin crawl. What is even more frightening, though, is the possibility that this might be it: that innovation is over, that we don’t need more broadband, because the best we can hope for is to download movies with unthrottled BitTorrent while artificial intelligence takes our jobs. I’m obviously being a bit dramatic, but from my perspective the risks of foreclosing innovation are more consequential right now in 2017 than they have been since the industrial revolution. If I am right, is it really so unreasonable to want more evidence that ex-ante regulation is essential? And again, we have regulation to handle abuses ex-post, specifically antitrust law. Indeed, this is why I actually think that, whether on purpose or accident, last week’s decision by the DOJ to try and block AT&T’s acquisition of Time Warner is appropriate and consistent with the FCC’s decision. I believe we need stronger antitrust enforcement generally, but we really need it given the risks — which I absolutely acknowledge! — of ISPs behaving badly. What is not at all helpful, though, is framing these trade-offs as moral choices. It is to society’s detriment that this really rather esoteric issue has become so tribalistic in nature: how can we properly evaluate and balance the trade-offs we need to make in issue after issue if everything is cast as good versus evil?